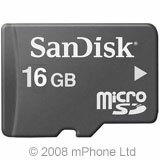 The microSD card is an ultra small, semi-removable flash memory module based on miniSD card and TriFlash designs for selected mobile phone products, especially the transfer of personal content between microSD-enabled phones. N.B. To ensure compatibility of the 32GB memory card, please check your handsets user guide or manufacturer specification pages. Not all devices support these microSD cards. Please see your user manual or contact your device manufacturer for details. To ensure compatibility, look for the microSDHC logo on the product or packaging of your phone or PDA, camera or Phone. N.B. To ensure compatibility of the 16GB memory card, please check your handsets user guide or manufacturer specification pages. TransFlash 8 GB Memory card with SD Adaptor. The adaptor allows the TransFlash card to be inserted into devices that read a full size Secure Digital (SD) card. Use this memory card in your mobile device and other compatible devices. TransFlash 4 GB Memory card with SD Adaptor. The adaptor allows the TransFlash card to be inserted into devices that read a full size Secure Digital (SD) card. 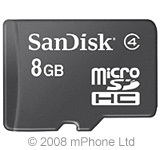 Use this memory card to store images and music in your handset.